Seeking privacy for your new backyard pool or company parking lot? Preslatted chain link fences are your best bet. With slats threaded through the fencing, visibility is reduced by up to 98%, keeping attractive or unattractive things from view. EagleSlat reduces the visibility through your chain link fence by 75%, making it perfect for seclusion in a busy city. Available in both classic galvanized and vinyl coating, EagleSlat provides you with a newfound level of comfort by way of privacy. 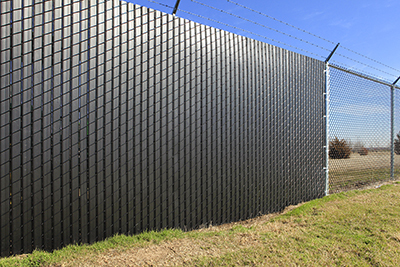 EagleMax reduces the visibility through your chain link fence by 98%, providing you with optimal privacy. EagleMax provides this by increasing the size of the slat by way of adding specially angled “fins” that reduce the ability to see between the slats. Available in both classic galvanized and vinyl coated, EagleMax gives you the max when privacy is key.